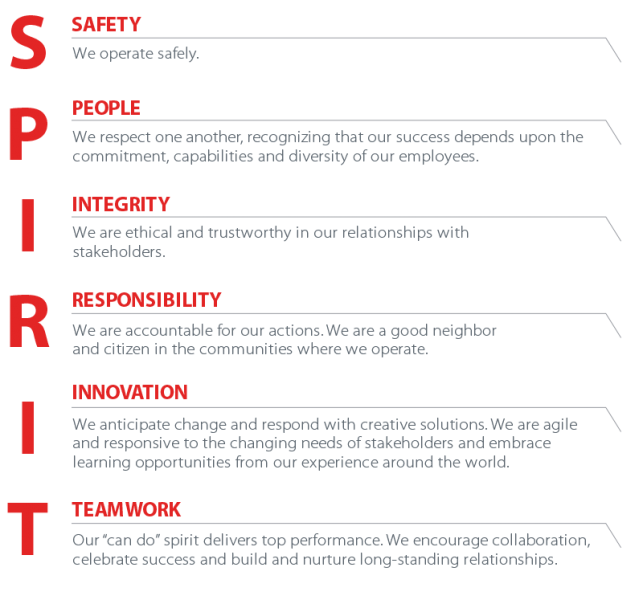 ConocoPhillips' SPIRIT Values ConocoPhillips’ SPIRIT Values set the tone for how we behave with all of our stakeholders, internally and externally. Our SPIRIT Values guide the way in which we operate, and transcend any language and any location. These Values are integral to the way in which we conduct our business in Timor-Leste. They enshrine our philosophy of operating safely, respecting people, acting with integrity, taking responsibility, embracing innovation and fostering teamwork. As a responsible corporate citizen of Timor-Leste, we aspire to be a valued member of the community. We want to contribute to a society in which people are safe, healthy and educated, and which takes environmental care seriously. We want to build communities' capacity to develop economic initiatives that will help them to become robust and resilient. ConocoPhillips endorses the Extractive Industries Transparency Initiative (EITI), which seeks to ensure that natural resource wealth is an engine for sustainable economic growth that contributes to sustainable development and poverty reduction. You may review further information on our economic transparency statement. In 2003, the Timor-Leste Prime Minister and ConocoPhillips declared their joint intention to support the EITI, which aims to create transparency around payments made by oil and gas companies to governments and the revenue governments receive from these companies. Timor-Leste became the third country in the world and the first in the Asia Pacific region to receive EITI certification on 1 July 2010. For more information on our Commitment to Governance click here.